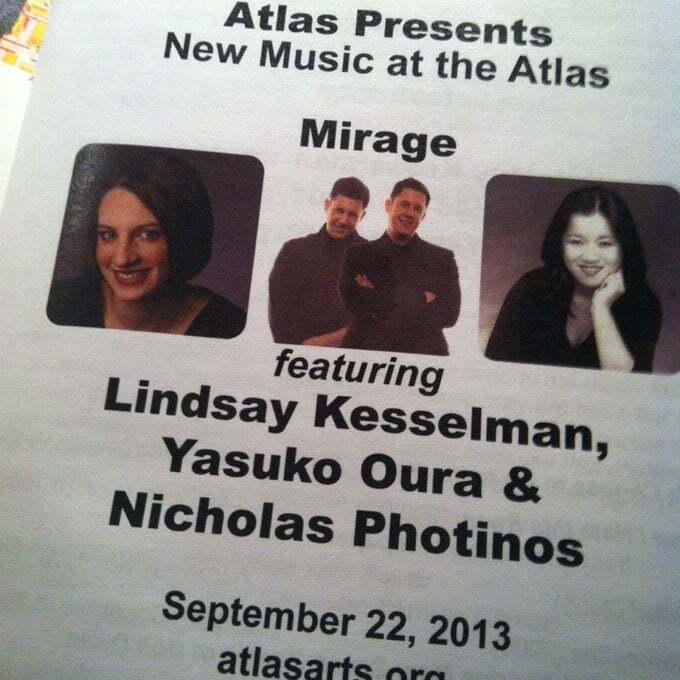 Armando Bayolo, Curator – New Music Series, explained in his introduction that Mirage is a ‘new music supergroup.’ Featuring Lindsay Kesselman (soprano), Nicholas Photinos (cello), and Yasuko Oura (piano), Mirage is dedicated to performing music being written now. In fact, not a single piece on the concert was written before 2000. It is a feat that all three of these musicians could find the time to prepare a recital of these works; but, not surprising in the least to see their devotion clearly played out on the stage last Sunday at the Atlas Performing Arts Center in Washington D.C. Soprano Lindsay Kesselman began the recital by explaining that there was a subtle theme that runs throughout their programmatic choices. The delicate connection between the pieces featuring voice, cello, and piano in different variations was the concept of ‘overcoming boundaries’. The theme was clearly unveiled in the very first piece of the recital. Robert Honstein’s “We Choose to Go to the Moon” has a reliable, static element in the consistently rising vocal line and the regularly arpeggiated cello figures. Kesselman’s crystalline soprano was immediately understandable in the intimate Sprenger Theatre. Her clarity of diction and even mezza voce across all registers made this an inviting opening piece to the recital. Honstein set a portion of text from President John F. Kennedy’s 1962 speech outlining America’s goal of sending a manned mission to the moon. One of the elements I enjoy most in Photinos’ playing is the ‘reedy’ quality that he can elicit from his cello. In addition to the lush sounds so evocative of the cello, this quality cuts straight to the ear especially in his playing of Aaron Jay Kernis’ “Ballad.” Composed in 2004, Kernis dedicated the piece to the memory of his parents and their love for lyrical music and includes some honoring of jazz harmonies beneath the melody. Ultimately, the reediness gives way to the most gossamer-delicate harmonics over lofty chords in the piano. Finally, the most successful pieces of the evening were Amy Beth Kirsten’s “yes I said yes I will Yes” and the piece that inspired the ensemble’s name “Mirage” by Kaija Saariaho. Photinos described “yes I said yes I will Yes” and showing off “Amy’s lyricism and sensuality.” Originally commissioned by Kesselman for voice and double bass, in this setting the cello takes on an almost flamenco guitar sound which underscores the sensuality mentioned. Kesselman seemed most vocally free and revelatory in this and “Mirage.” It was in the Saariaho that Kesselman, Photinos, and Oura played at the highest degree of equality between the instruments; each musician fully exhibiting the complex, organic sounds of the work. Hey – I know Linsday! She’s amazing. Me too! We met at MusicX and I couldn’t pass up a chance to see her sing in D.C.!